EAST LANSING, Mich. — Michigan State University Assistant Police Chief Valerie O’Brien is on paid administrative leave effective April 3, a source has confirmed to FOX 47 News. MSU spokesperson Emily Guerrant confirmed the news Wednesday. Guerrant would not comment as to why O'Brien was placed on leave. O’Brien is the leader of the Department’s Field Services Bureau. The bureau handles specialized issues including relationship violence and sexual misconduct. The University confirmed with FOX 47 News that O’Brien was placed on leave Wednesday, but would not say why. 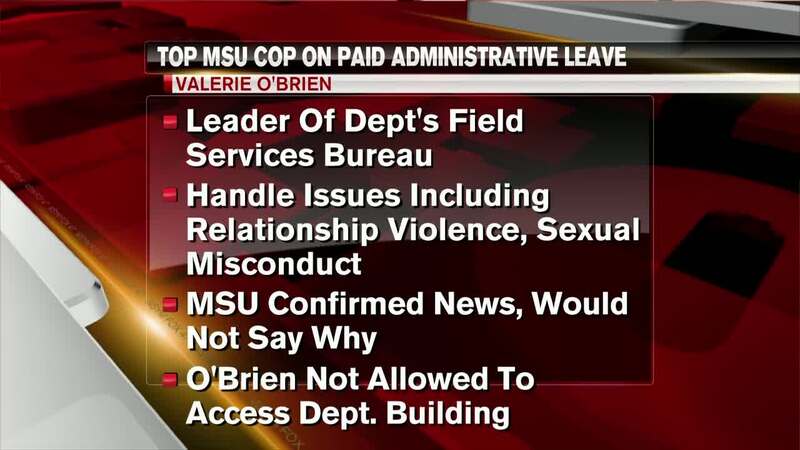 Michigan State is also not commenting on if O’Brien’s leave is connected to an ongoing Title Nine investigation in the Police Department. Several employees within MSU’s Department have been under investigation for possible Title Nine violations. The investigation started last month and is still ongoing. One of those department members is JJ Bradoc, who has been on administrative leave since February 1. The department would not comment as to why he was placed on leave.